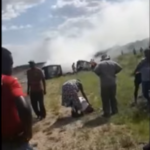 THE 13 victims that burned beyond recognition in the head-on collision between two long distance minibus taxis on Sunday can only be identified positively with the help of forensic science and their DNA profiles. According to the Namibian Police’s Public Relations Division the process of positively identifying the people that died a horrific death while trapped in the burning wrecks of the two minibus taxis has already started. The official police report states that 18 people survived the terrible crash. One survivor was the driver of one of the vehicles while five children and 12 other adults also survived the incident. According to the crime bulletin issued by Chief Inspector Kauna Shikwambi all the injured persons were transported to various hospitals in Otavi, Otjiwarongo and Tsumeb for medical care shortly after the horrific crash. The remains of the deceased persons will be transported to the Police Mortuary in Windhoek for the forensic identification process to commence. The victims will be identified through the use of DNA profiles and relatives of the deceased are requested to travel to Windhoek to supply pathologists with DNA samples. More information about what is expected from bereaved family members can be obtained from Chief Inspector Shatipamba at 081 311 4842.